Ever wondered what $1500 will get you in the way of a brand new motorcycle? Zac Kurylyk did and this is how it worked out. What can you get for $1,500 these days? That won’t pay tuition for most college students. It won’t get you much of a vacation. If you want to buy a used car for that money, expect problems and more dollars spent keeping it going. But, $1,500 is what I paid last year for a brand new motorcycle. When I decided to see what the dual-sport scene was all about last spring, I didn’t know what to do. I was tired of buying cheap motorcycles and then not having the funds to keep up with the constant repairs. Then I found a leftover 2007 Lifan GY-5 enduro (equipped with a 200cc air-cooled engine) out at Coast to Coast Motorsports in B.C. for $1,500, plus $500 for shipping to get it to the east coast. It didn’t take long for me to order one. Assembling the Lifan out of the crate wasn’t difficult, despite the lack of instructions. The bike arrived about two weeks later in a crate. It was already mostly assembled – I simply had to put the wheels and chain on the machine, bolt on the brakes and handlebars, and figure out the light kit. This doesn’t sound like much work,but then there weren’t any assembly instructions included either. Thankfully I had a couple of resources to draw on. 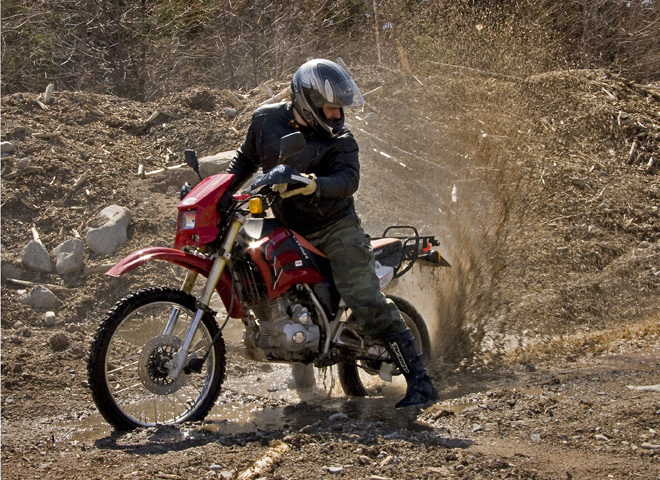 My cousin Glen had purchased a Lifan as well, and had just finished assembling his, so he had a good idea of what to do (and what not to do). As well, I found some helpful tips on www.chinariders.net that helped the process along. While the lack of instructions was slightly frustrating, I was glad to have the chance to assemble the bike myself – this way, I’d know it was done right. After reading many horror stories of improperly assembled Chinese bikes that rattled apart on their first ride, I took my time with everything and used a lot of Loctite. It’s a bit of a homage to the 70s, but it looks sharp … ish. I also took the opportunity to do some upgrades. Not fancying a flat in the middle of the woods, I upgraded the tire tubes to the beefiest available. I also upgraded some seals and other odds and ends. After putting the bike together (with parts left over! ), I was pretty impressed with the machine. The Lifan is essentially an odd amalgam of various Japanese machines, with some Chinese touches thrown in, but it looked sharp. There were also some very useful things that you don’t see on most small-displacement bikes, like anodized USD forks. I haven’t seen an LED gear indicator since I took a test ride years ago on a Suzuki GS425, but the Lifan has it. More and more Japanese manufacturers are cheaping out and not including luggage racks with their dual-sports, but the Lifan has one. While most people don’t miss kick-starters, I like them, and the Lifan has one of those too (along with electric start). Despite some of these nice touches, the engine itself seems to date back to the 1970s. If you read much about these bikes online, you’ll find owners and vendors claiming these bikes are Chinese copies of the XR250. These people are either nitwits or liars. 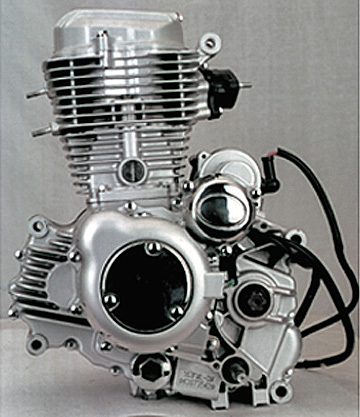 The counterbalanced pushrod 200cc engine looks a lot more like the motor used in Honda’s CG125 or XL185, and the rest of the bike looks nothing like an XR, even though it’s surprising how many of the bike’s smaller bits will interchange with Honda parts, if you are willing to do a little mixing and matching. Zac illustrates the really quick break-in method! 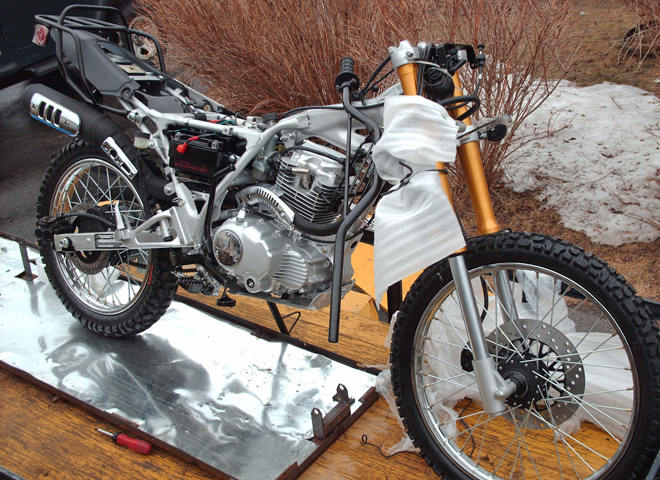 Of course, the first test was to see if the bike would actually start, and to my relief, it did. I did the quick break-in method (lugging the bike engine up a long hill, as was recommended to me), since I didn’t feel like riding a 200cc motorcycle around for a few hundred kilometers at 1,500 rpms. Registration also went surprisingly well. 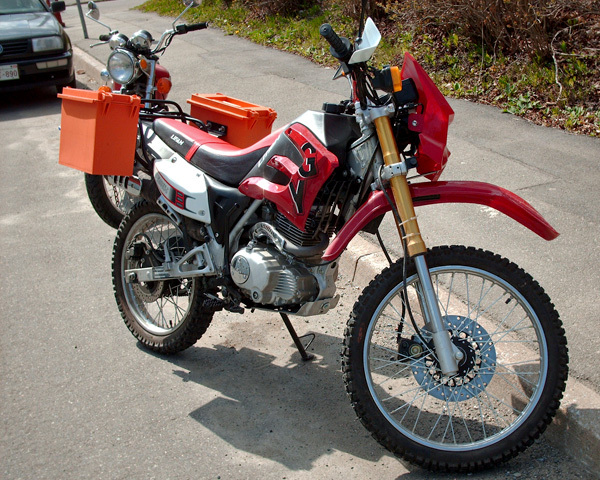 Even though the bike came registered as an off-road machine, I wasn’t forced to jump through any hoops to put it on the street, although according to the stories in chinariders.net, Chinese-bike owners in other provinces have had problems. I didn’t have any problems with my insurance company either. Much sturdier than the naysayers predicted. Now, I’ve spent most of my motorcycling career on bikes that were used and beat-up when I bought them, and used harder and beat-up more when I sold them, usually at a significant loss. All my paycheques, it seemed, went to either university tuition or motorcycle parts. Not so with the Lifan! I sold my car and took this bike everywhere, on-and off-road as my daily driver, and never had to perform any significant repairs. Online naysayers snidely predicted my motorcycle’s demise within weeks. I happily proved them wrong. Internet “experts” warned me parts would be impossible to find. The few parts I did need I was able to order within days from local dealers. I was even able to find some aftermarket parts (wraparound bark busters, neoprene fork protectors, magnetic drain plug) from Rocky Mountain ATV that fit and made the bike even more durable. Ammo boxes double up as usable hard bags. A welder helped me turn a set of ammunition boxes into a set of panniers that held up to considerable abuse on off-road camping trips. I found the Lifan to be surprisingly competent for a 200cc machine. With stock 16-46 gearing I could reach 110 km/h on the highway with a little planning, and could cruise at 90 km/h without too much trouble. 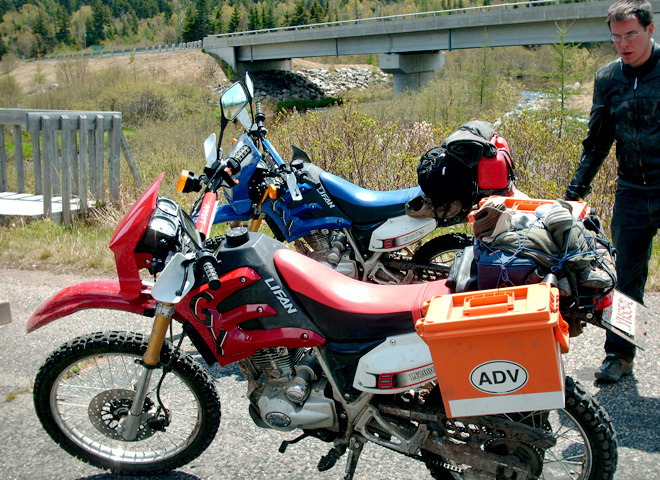 Passengers were pretty much out of the question, except for extremely short jaunts, but I took the bike on several camping, hunting, and fishing trips loaded down with gear, and had no problems keeping a steady pace on the highway. In town, the bike’s small engine was no problem at all, and its light weight was a huge benefit to a rider used to wrestling heavy four-cylinder pigs from the 1970s through traffic. The New Brunswick Lifan motorcycle club. I can’t say how many kilometers I put on the bike since I broke the odometer cable and was too lazy to replace it until the end of riding season, but the bike was my only transportation for a year and never failed to start once. But while the Lifan proved to be extremely reliable, there were still a few issues with the machine that needed sorting out. The first problem I noticed was the headlight. The stock bulb was about as useful as a flashlight taped to the handlebars, and the beam wasn’t easy to focus properly either. It took a while to find a decent replacement bulb – the machine uses BA20D bulbs, which aren’t easy to find in North America, unless you want weak snowmobile bulbs. I eventually ordered a set of 45/40w halogen units from the UK that did the job well. Suspension is not very giving. The bike’s fit and finish looked good at first but aged fast. To be fair, I left the bike outside without a cover the first year I owned it, but the bike’s seat cover and the anodizing on the forks still faded extremely quickly. The exhaust pipe rusted severely within weeks as well, no matter how much rust paint I used. The bike’s plastics are painted, not colour-dyed, so they scratched a bit as well. The biggest problem with the Lifan GY-5 was its suspension. The USD forks looked cool, but were pretty harsh. Earlier versions of this bike had conventional forks; I’ve talked to riders who have owned both versions and they actually preferred the earlier front suspension. Standing on the pegs for even the slightest of bumps is well recommended. The rear suspension was the real fly in the ointment, though. Part of the problem was the poorly designed rear linkage, and part of it was the rear monoshock that wore out quickly. This seriously limited off-road speed, and could also scare you if you hit a few bumps when leaned over into a turn on the pavement. It was amusing to watch friends when they borrowed the bike. After jarring their fillings on the first few potholes they hit, they’d learn to stand on the pegs when hitting even the slightest bump at speed. Searching the Internet forums will turn up a few fixes for the rear shock, but none of them are easy. I purchased a Honda CBR600 rear shock to swap for the original, but never got around to trying to fit it in. I sold the bike instead, this spring for $1,500 – the same price I paid for it (save for the shipping). 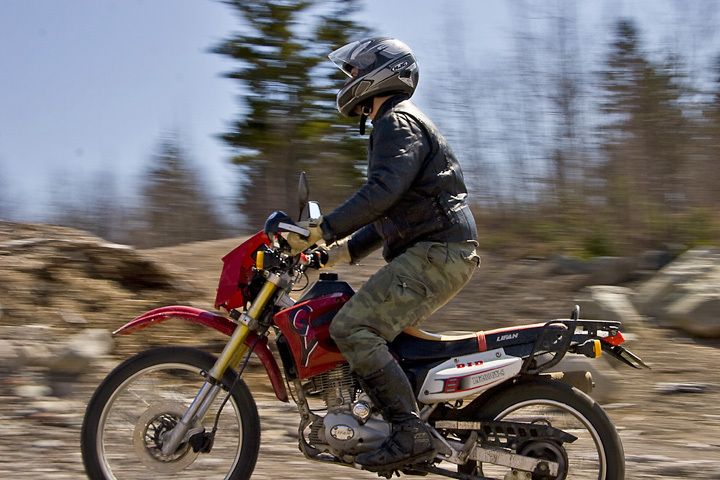 I moved up to a Suzuki DR650, but I would still love to have the Lifan back. It was easy to maintain and fun to ride, despite the suspension woes. It got great gas mileage, was extremely tough and very reliable, and was light enough to be fun to wrestle around on single-track trails. Rumour has it that Lifan’s newer GY-6 machine addresses many of the GY-5’s problems, and I’d love to get my hands on one to find if that’s so. 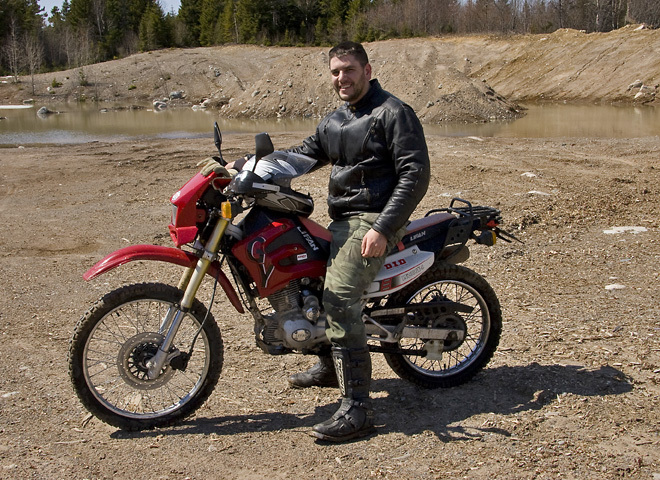 Zac Kurylyk is an editor and writer for Adventure Motorcycle magazine. I’m building an amphib tractor for the Amazon in Peru and plan to use the Lifan 200 GY as the power source. Great article. Where can I get my hands on more technical specifications?? 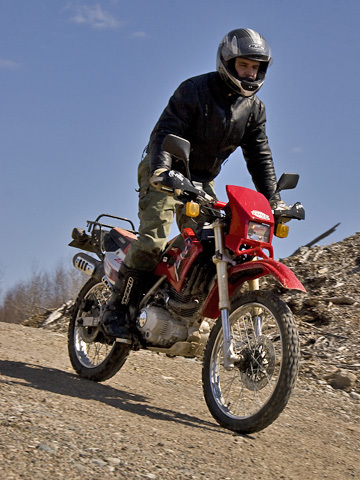 i have the Lifan 200cc enduro–750 miles–top speed (falt raod/75F/200 lb rider)= 62 mph. only problem= bike wont idle at 1300 rpm—wants to idle at 2800 rpm–if i lower> bike wil stall. what”carb” adjustments are tere to make/try. wld lik to change to “street tires”…whic size/brand wld u guys recommend? I bought a 2008 Lifan 200GY5 and think it’s wonderful, it’s done 10,000 Kms now and apart from clutch problems when it was quite new which the supplying dealer fixed for me on a 50/50 basis I’ve had no problems. I did some mods that have helped tough, I changed the air filter to a conical low resistance one, changed the main jet to a 110 (from a 98) which gave a useful power increase and improved the already good economy. Next I changed the rear sprocket to a 38 tooth one which was too high so changed the front one to a (Honda) 16 toot and magic, more power, longer legs and fab fuel economy. I bought my gy-5 from dealer in VA for $1,450 w/ free shipping. I’ve had it a little over two years and have almost 10,000km on it. Most of these miles are street but I’ve had my bike off-road on some pretty nasty trails and it does excellent even with the street/trail tires. I have not had one single problem with it (other than the so-so suspension) and it seems to run better now than it did when it was brand new. I’ve got a Zongshen Sierra on it’s way in the mail. The gy-5 is going to my girlfriend for a learner bike and I assume will be around for a long time to come. Great article! I have a KONKER KSM 200 in Montreal, and I can tell you my bike makes turning more heads than a Japanese one. 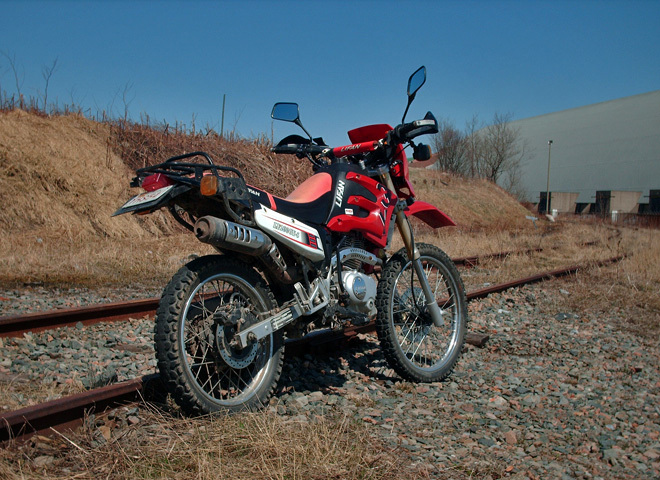 I put on it some cosmetic parts like Acerbis hand guards and Yamaha XT250 rear rack. In project there are Kawasaki KX250F body panels. After 5 months and 628km the battery died. The dealer Promotopieces.com propose me to pay a little amount (38$ + tax) and get a new Yuasa YB9L-B replacement instead the Chinese “no name” one. The oil filter is the same from Suzuki AN400 Burgman, so the next oil change will be made to a Suzuki dealer in the neighborhood. What do you want more? I had a 2006 gy-5 Lifan and put 2500 kms on it before I sold it to get a Konker KSM200 Motard. I had no problems with it just had to ride within the bikes limits [ no Evel kenivel stuff ]The review is right on the money. I hope to check out the gy-6 when it is available. Too bad I do not have the gy-5 as there could be x3 members in the New Brunswick Lifan club! Lifan will be in business in 5 or 10 years, but they may not have an importer in Canada. Not to worry! You can import Lifan parts from other countries as well, and even better, many Chinese motorcycle parts will mix and match with each other. As well, some parts will interchange with Honda. My two favourite websites with China bike information are http://www.mychinamoto.com and http://www.chinariders.net. I’m sure Zac would be happy to answer that question. 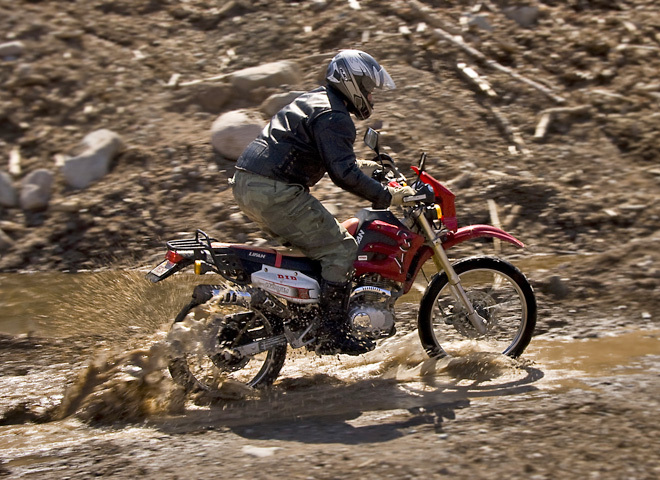 We probably weren’t clear but this piece is a reader’s story submission, not a CMG test ride. One of my little red flags went up as soon as he mentioned he sold it within the year. I’m sure people asked this about the Japanese manufacturers, but where will these guys be in 5 or 10 years? Would be nice to see some actual CMG content on stuff like this..
Have you heard of Saga Canada? Is it better than the Saga 250cc Enduro? Your best bet at this point is to buy one on Kijiji. I’m not sure how much inventory Coast to Coast Motorsports has left, if any. I know that Mini Motors in Fredericton, N.B., was selling their Lifans pretty cheap this summer, and I believe they ship . . .
Where can I get one in Ontario?